Dacia has released UK pricing and spec details of two new turbocharged petrol variants of its Duster SUV, on sale now. The TCe 130 engine is available from mid-level Comfort spec and above, priced from £14,395. The new 1.3-litre unit makes 128bhp and 177lb ft of torque, enough for a 0-62mph time of 11.1sec and a top speed of 119mph. Also available is the more powerful TCe 150, making 148bhp from a tuned version of the same unit. It does 0-60mph in 10.4sec and hits 124mph flat out. It's only available in top-spec Prestige trim, and as such is priced from £16,295. Both variants have identical quoted WLTP fuel economy of 47.0mpg, with CO2 emissions of 137g/km. Both variants come exclusively with a six-speed manual gearbox and are front-wheel drive, with 4x4 versions of both to be added in the middle of next year. There's no word on whether an automatic gearbox will be offered at a later date. 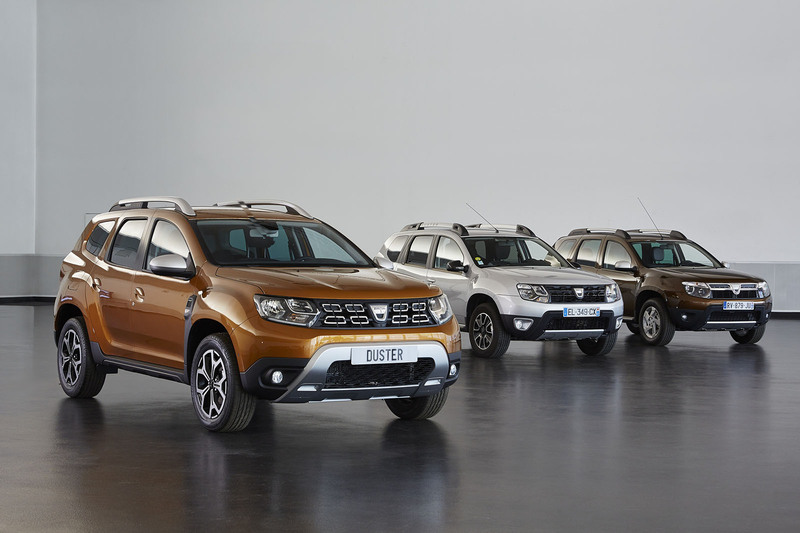 The Duster range contains four trim levels: Access, Essential, Comfort and Prestige. The base variant, priced from £9995, comes with LED daytime running lights, height-adjustable front headrests and seatbelts, an engine stop-start system and automatic emergency braking. It also gets steel wheels and wind-down rear windows, however. Essential upgrades the steel wheels to a different design and adds painted bumpers, air conditioning, a DAB radio and Bluetooth for £11,595. Comfort, at £13,195, adds all-round electric windows, alloy wheels, electric adjustment for the mirrors, a 7.0in touchscreen infotainment system with sat-nav, a rear-view camera and parking sensors. Top-of-the-range Prestige (£14,395) adds diamond-cut alloy wheels, a multi-view camera, keyless entry, climate control, keyless entry and blindspot monitoring. This version is £680 more expensive than the entry-level Ford Fiesta. Access trim is only available with the 113bhp and 115lb ft 1.6-litre SCe petrol engine with front-wheel drive, which achieves 43.5mpg and CO2 emissions of 149g/km. All other trims can choose this petrol engine with front or four-wheel drive (the latter with 40.7mpg and 158g/km CO2), or a 113bhp, 192lb ft diesel engine with front-wheel drive that records 64.2mpg and 115g/km. There's no automatic transmission. The 0-62mph sprint takes between 10.5sec and 12.9sec, with four-wheel-drive versions being the slowest, while top speed is 105mph for all four-wheel-drive models, 107mph for front-wheel-drive petrols and 111mph for front-wheel-drive diesels. Diesel and four-wheel-drive petrol models carry a £2000 premium over front-wheel-drive petrols. Metallic paint remains a £495 option, while leather upholstery costs £500. About a third of Dacia's UK sales are of Dusters, so it's a key model for the brand, particularly in the small SUV segment. About 80% of Dusters will be petrol, with the front-wheel drive, petrol Prestige model expected to be the most popular, followed by the front-wheel-drive petrol Comfort. The new Duster was revealed in full at the 2017 Frankfurt motor show. Despite not a single panel being carried over from the previous car, the exterior is an evolutionary design. Laurens van den Acker, Groupe Renault's senior vice president of corporate design, said this was down to the model's sales success. In addition, the Duster’s interior has been reworked substantially by Dacia to provide a more upmarket feel while ensuring that the car remains affordable and usable. The dashboard has been redesigned, with the touchscreen moved to the upper part. That system now includes an optional multi-view camera for the first time (standard on Prestige). Other new equipment options available on a Dacia for the first time include blindspot warning, automatic air conditioning and automatic headlights — all of which are standard on Prestige. The latest Duster sits on the same platform as its predecessor and has identical overall dimensions, although the windscreen has been moved forward slightly to improve interior space. The car now sports a broader front grille and wider headlights, while the rear lights have been moved to the corners. The square wheel arch style of the previous Duster has been retained, with new roof bars added. Dacia has sold more than a million Dusters since 2010 and year-on-year sales continue to rise. Van den Acker said that influenced Groupe Renault’s thinking about the new model’s design. 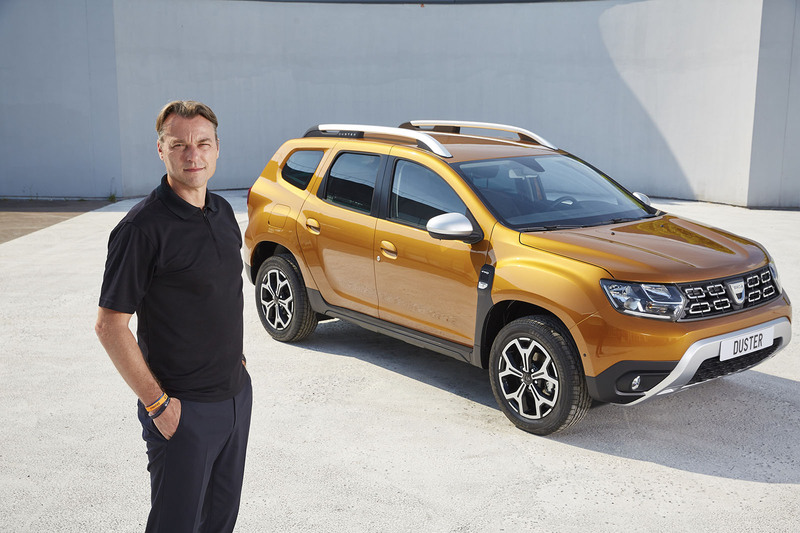 Dacia design boss David Durand said ensuring the Duster retained an unpretentious feel, reflecting value for money, was vital. “The original brief was a white page, so we could explore everything — even if we did go back to familiar themes,” he said. Why didn’t you increase the size of the Duster? Did having Dacia help shape a design direction for Renault? Can you explain Dacia’s success? Difficult to see the basic, un-trinketed version in these official pics, but it's possibly lost the simplicity of the original. I loved the UN-white basic launch version - basic transportation with no pretensions. Of all the reveals today - Bently, Porshce - this is the one that actually interests me the most. Either I'm getting old and cynical, or high-end vehicles aren't really progressing much between new infotainment screens and the like. I agree with, although worth noting yhecreason the dimensions gave not changed is because this is just a facelift and not an all new car. Whereas the Cayenne us all new but looks like a refresh only! For me, a facelift is a tinkering with the peripheral design elements of a car's design, like grilles, bumpers and light graphics, while leaving the sheetmetal largely alone. This new Duster might retain it's predecessor's platform, but it has an all-new body, complete with a windscreen that's been pushed 100mm further forward. These cars succeed these days because there's no such thing as a bad car anymore. Even a cheap SUV serves it's purpose well and cheap SUV's like this and the Vitara have a certain 2 fingers up in the air to Q2 and X3 type owners. Good basic motoring that is proving poular where people are spending their own cash. Keep up the good work Renault. Just look at that ground clearance! Now that's a proper SUV. Agree, and at a price your not going to cry over if it scrapes over a bit of rock unlike many of the 'best rated off-road' SUV's now in the 60K+ and then some range, where the only people taking them off road are journalists in demo cars they don't have to worry about damaging. Agree, and not just the ground clearance. Look at the ramp and departure angles as well. You don't see that in SUVs designed exclusively for the roads. Actually looks bigger than the outgoing model , maybe it's just the shot. Something appealing about this no nonsense SUV which is more purposeful than Mokas Jukes etc. Glad they have evolved the design as it's a good formula that seems to work.